I am in love with this roasted butternut squash soup. It’s sweet, savory, and just a bit spicy. The roasted butternut squash makes the most delicious base for this vegan soup and the pesto croutons and cashew cream give it a rich, delicious crunch that makes eating soup so much more enjoyable. Let’s be honest, chewing makes eating more satisfying! Although this recipe has three components, you can always just make roasted butternut squash soup if you don’t want to spend the entire hour actively cooking. But I promise the extras will be totally worth it! If only I had an industrial sized food processor… I want to make this roasted butternut squash soup by the gallon! Preheat the oven to 425 degrees Fahrenheit and line a baking sheet with parchment paper. Place the butternut squash on the pan and rub about 2 tablespoons of coconut oil on the inside and outside of the squash. Sprinkle both sides with salt and pepper. Roast the squash face down for 45 to 50 minutes. Set the squash aside to cool for about ten minutes. Then use a large spoon to scoop the butternut squash flesh into a bowl and discard the tough skin. Meanwhile, combine the soaked cashews, filtered water, lemon juice, and 1 teaspoon of sea salt into a food processor. Process until smooth and creamy, about 2-3 minutes. Set aside. In a large soup pot, melt 1 tablespoon coconut oil over medium heat. Add the chopped shallot and 1 teaspoon salt. Cook for 3-4 minutes, until the shallot has softened and is starting to turn golden on the edges. Stir frequently. Add the garlic and cook until fragrant, about 30 seconds. Keep stirring. Transfer the cooked shallot and garlic to your blender or food processor. Add the squash, maple syrup, nutmeg, red pepper flakes, and a few twists of freshly ground black pepper. Pour in the vegetable broth, being careful not to fill the container past the maximum fill line (you can stir in any remaining broth later). 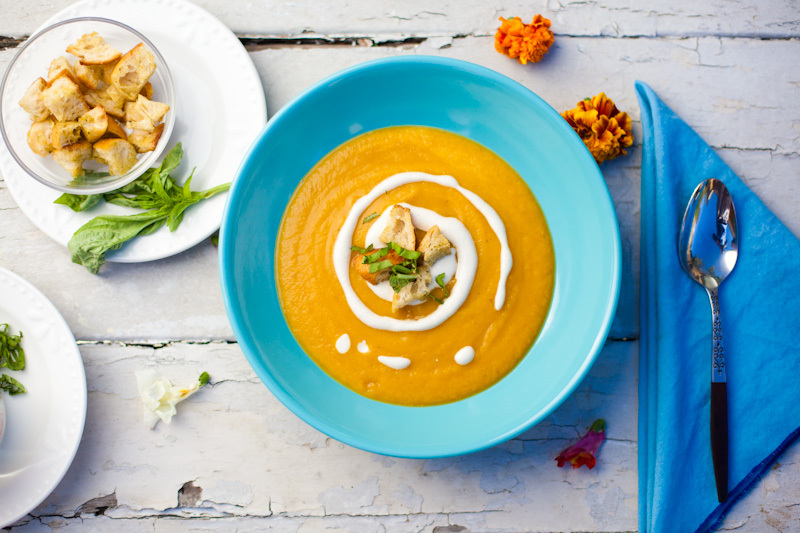 Blend or mix for 2-3 minutes, until the roasted butternut squash soup is smooth and creamy. Return the soup to the pot to add the remaining veggie broth and heat to serve. Add 1 to 2 tablespoons coconut cream, to taste, and blend well. Taste and blend in more salt and pepper, if necessary. Portion the roasted butternut squash soup into serving bowls, then drizzle with cashew cream and top with a few pesto croutons. (Recipes below). Preheat the oven to 400 degrees. Slice the bread into small cubes. Combine the remaining ingredients into a blender and mix for 1 minute. Drizzle the basil garlic mixture over the bread crumbs and toss with your hands to combine. Bake the croutons on a baking sheet until crisp, about 15 minutes. Did you make this roasted butternut squash soup? Leave us a comment and tell us all about it! And while you’re at it, post a photo to Instagram with the tag #carrotsandflowers 🙂 It will make our day! This is a great recipe. If you have a pressure cooker you can “roast” squash in it instead of an oven, takes about 20 minutes. Great when you don’t have time. I stole the technique from here http://dadcooksdinner.com/2013/01/pressure-cooker-roasted-sweet-potato-puree.html/ It’s for sweet potatoes, but works well with squash too.